The Van (Y Fan) mine near Llanidloes in Montgomeryshire had been worked by different mining companies in the 1850s, but in 1865 a rich seam of lead was found undergound at Van. The mine exploited this resource for some years after this new discovery, and by 1876 it was producing thousands of tons of lead and providing many jobs. At the busiest time for the industry there were over 700 men working there. A new village was developed to house the miners and their families with a school and chapel. Production declined as the century wore on and the mine suffered from cheaper ores produced elsewhere. The mines closed and reopened at various times, but by 1910 what had once been the largest lead mine in Britain was failing and it closed completely in 1921. Of Trederwen Hall, Arddleen in the parish of Llandrinio. Arthur was the eldest son of John Vaughan, who was Coroner for the County of Montgomeryshire from 1649 to 1665. Arthur followed his father in the law and succeeded him to this office and held it until 1679. He married Elizabeth Wynne of Criggion Hall. He was four times brought before the Court of the Manor of Deythur for encroaching on the common land. 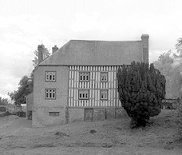 He was Sheriff of Montgomeryshire in 1691 and spent most of his later years at Criggion Hall. The fourth son of Owen Vaughan of Llwydiarth, Montgomeryshire. Like his three elder brothers (John, Sir Robert and Roger Vaughan) he was a lawyer by training. In 1622 his brother Sir Robert bequeathed him estates in Montgomeryshire and Merioneth. Sir Robert's widow Catherine the daughter of William Herbert, Lord Powis, contested the claim and the lawsuit dragged on for many years. Vaughan served as MP for Merioneth and supported parliament in its disputes with royal authority being accused of opposing the Commission of Array sent to Denbighshire in 1642. After 1646 he was elected MP for Montgomeryshire and in 1648 was imprisoned as a result of "Pride's Purge". After a period of accusation and division his fortunes improved in 1659 when he was again elected MP for his home county and was appointed Associate to the Board of the Inner Temple. Further complaints were brought against him after the restoration but he still succeeded in being elected to parliament in 1661 the year of his death. Poet. Related to the Vaughans of Tretower, Henry Vaughan was born at the family home of Newton (Trenewydd) in the parish of Llansantffraed in Breconshire and educated with his twin brother Thomas (below) by Matthew Herbert, Rector of Llangattock. He studied at Jesus College, Oxford but did not take his degree, afterwards studying law for a while in London before being summoned home as the country slid into civil war. He served as secretary to judge Sir Marmaduke Lloyd. He and his brother fought for the king in the civil war. Henry was at the battle of Rowton Heath and at the siege of Beeston Castle in Cheshire. After the failure of these campaigns the brothers returned home and Thomas became rector of Llansantffraed. Henry Vaughan’s poetry from this period records his unhappiness at coming back to a Breconshire under puritan control and not having a clear role for himself. He was influenced by the work of the other great poet of the period from mid Wales, George Herbert, and like him sought for the hand of God in nature. His brother William died in 1848, and Thomas was evicted from his parish by the puritan authorities. Henry seems to have begun practicing medicine about this time, and although his gravestone proudly affixes M.D. after his name, no record of his training has survived. His wife died and he married her sister Elizabeth adding a further 4 children to the 4 by his first wife. His father was arrested for debt and then died in 1658 and his brother died, still pursuing alchemical research, in 1666. After a dispute with his son he moved out of Newton into Holly Bush Cottage at Scethrog. His poetry is influenced by Welsh verse forms and is full of the celestial imagery for which he is known. Along with George Herbert he is generally accepted as a leading poet of the Metaphysical school. Author, youngest daughter of Hugh Vaughan Vaughan, Clerk of the Peace and of Radnorshire County Council. Born at Builth and educated privately she later claimed to have gained all her worthwhile education form S.P.M. Bligh, author and “Squire of Cilmery Park”. She served in a Red Cross Hospital and Women’s land Army organiser during World War I and in 1923 did a course in writing at Bedford College, London. Here she met Charles Morgan drama critic of The Times. Like Hilda he had ambitions to write fiction and the two married. Most of her novels were set in the town where she was born, Builth Wells, which she disguised using the name "Langantyn". Her books included The Battle To the Weak, 1925 (her first) and The Invader, 1928. Her most successful novel was The Soldier & the Gentlewomen, published in 1935 and set in Carmarthenshire. This was something of a departure in tone and throughout her career as a novelist she was never content to just plough the same furrow. She also had two plays performed in London. James Vaughan of Hergest was appointed Radnorshire's second Sheriff in November 1541. He was the eldest son of Watkin Vaughan of Hergest by Sybil Baskerville and was born around 1485. A surviving letter of 1533 describes him as "the King's old servant" and praises his loyalty to the crown. He married Elizabeth the daughter of Sir Edward Croft of Croft Castle. Of the Vaughan family of Llwydiarth Hall in the parish of Llanfihangel, Montgomeryshire. John Owen Vaughan served as Bailiff of Llanfyllin in 1567 and was a magistrate for the county from 1571. His interests seem to have been in conflict with those of the powerful Herbert family and there were legal suits and disputes between respective retainers. Vaughan was turned down for sheriff by Sir Edward Herbert in 1581 but served in 1583. He did not serve again and his son did not serve in the commission of the peace until 1598 by which time reconciliation between the families had been achieved. Vaughan, Thomas (d.1469) "Black Vaughan"
Alchemist and poet of Newton, Llansantffraed. Twin brother of poet Henry Vaughan (above). Educated by Matthew Herbert, rector of Llangattock. Graduated from Oxford and became Rector of Llansantffraed in 1844. Fought for the king in the civil war before coming home to his parish. He was evicted from his living by Parliamentary commissioners who accused him of drunkenness and “whoredom”. He then went off to study alchemy at London and Oxford. He declared himself to be a philosopher but rejected Aristotle and Descartes. His ‘alchemy’ was more a search for the secrets of nature. He published eight books under the name Eugenius Philalathes and poetry in English, Latin and Welsh. He died in 1666.